Pinocchio is a 1940 American animated musical fantasy film produced by Walt Disney Productions and based on the Italian children's novel The Adventures of Pinocchio by Carlo Collodi. It was the second animated feature film produced by Disney, made after the success of Snow White and the Seven Dwarfs (1937). The plot of the film involves an old wood-carver named Geppetto who carves a wooden puppet named Pinocchio. The puppet is brought to life by a blue fairy, who informs him that he can become a real boy if he proves himself to be "brave, truthful, and unselfish". Pinocchio's efforts to become a real boy involve encounters with a host of unsavory characters. The film was adapted by Aurelius Battaglia, William Cottrell, Otto Englander, Erdman Penner, Joseph Sabo, Ted Sears, and Webb Smith from Collodi's book. The production was supervised by Ben Sharpsteen and Hamilton Luske, and the film's sequences were directed by Norman Ferguson, T. Hee, Wilfred Jackson, Jack Kinney, and Bill Roberts. Pinocchio was a groundbreaking achievement in the area of effects animation, giving realistic movement to vehicles, machinery and natural elements such as rain, lightning, smoke, shadows and water. The film was released to theaters by RKO Radio Pictures on February 7, 1940. Critical analysis of Pinocchio identifies it as a simple morality tale that teaches children of the benefits of hard work and middle-class values[citation needed]. Although it became the first animated feature to win a competitive Academy Award – winning two for Best Music, Original Score and for Best Music, Original Song for "When You Wish Upon a Star" – it was initially a box office disaster. It eventually made a profit in its 1945 reissue, and is considered one of the greatest animated films ever made, with a 100% rating on the website Rotten Tomatoes. The film and characters are still prevalent in popular culture, featuring at various Disney parks and in other forms of entertainment. In 1994, Pinocchio was added to the United States National Film Registry for being deemed "culturally, historically, or aesthetically significant". A live-action adaptation of the film is currently in development. Jiminy Cricket explains that he is going to tell a story of a wish coming true. His story begins in the Italian workshop of a woodworker named Geppetto. Jiminy watches as Geppetto finishes work on a wooden marionette whom he names Pinocchio. Before falling asleep, Geppetto makes a wish on a star that Pinocchio will be a real boy. During the night, a Blue Fairy visits the workshop and brings Pinocchio to life, although he still remains a puppet. She informs him that if he proves himself brave, truthful, and unselfish, he will become a real boy, and assigns Jiminy to be his conscience. Geppetto discovers that his wish has come true, and is filled with joy. However, on his way to school, Pinocchio is led astray by Honest John the Fox and his companion, Gideon the Cat, who convince him to join Stromboli's puppet show, despite Jiminy's objections. Pinocchio becomes Stromboli's star attraction as a marionette who can sing and dance without strings. However, when Pinocchio wants to go home for the night, Stromboli locks him in a birdcage. Jiminy arrives to see Pinocchio, and is unable to free him. The Blue Fairy appears, and asks Pinocchio why he was not at school. Jiminy urges Pinocchio to tell the truth, but instead he starts telling lies, which causes his nose to grow longer and longer. Pinocchio vows to be good from now on, and the Blue Fairy returns his nose to its original form and sets him free, while warning him that this will be the last time she can help him. Meanwhile, across town, Honest John and Gideon meet a coachman who promises to pay them money if they can find naughty little boys for him to take to Pleasure Island. Encountering Pinocchio on his way home, they convince him that he needs to take a vacation there. On the way to Pleasure Island, he befriends Lampwick, a delinquent boy. Without rules or authority to enforce their activity, Pinocchio and the other boys soon engage in smoking tobacco, gambling, vandalism, and getting drunk, much to Jiminy's dismay. Later, while trying to get home, Jiminy discovers that the island hides a horrible curse: the boys brought to Pleasure Island are transformed into donkeys for their misbehavior and sold into slave labor. Jiminy runs back to warn Pinocchio, only to discover that Lampwick has transformed into a donkey; Pinocchio manages to escape the island, only partially transformed. Upon returning home, Pinocchio and Jiminy find the workshop vacant. They soon get a letter from the blue fairy as a dove, stating that Geppetto had ventured out to sea to save Pinocchio from Pleasure Island, but was swallowed by a giant Sperm whale named Monstro, and is now living in his belly. Determined to rescue his father, Pinocchio jumps into the sea accompanied by Jiminy. Pinocchio is soon swallowed by Monstro as well, where he is reunited with Geppetto. Pinocchio devises a scheme to make Monstro sneeze, giving them a chance to escape. The scheme works, but the enraged Whale chases them and smashes their raft. Pinocchio pulls Geppetto to safety in a cave before Monstro crashes into it. Geppetto, Figaro, Cleo, and Jiminy are washed up safely on a beach, but Pinocchio is killed. Back home, Geppetto grieves over Pinocchio with Jiminy Cricket and the pets also mourn alongside. The Blue Fairy, however, decides that Pinocchio has proven himself brave, truthful, and unselfish. To reward him, the Blue Fairy resurrects Pinocchio, reversing the Pleasure Island curse and turning him into a real boy. Pinocchio awakens and reveals that he is alive and a real human boy, and everyone celebrates. Jiminy steps outside to thank the Fairy, and is rewarded with a solid gold badge that certifies him as an official conscience. Dickie Jones as Pinocchio, a wooden puppet carved by Geppetto, and turned into a living puppet by the Blue Fairy. Cliff Edwards as Jiminy Cricket, a cheerful and wise cricket, who acts as Pinocchio's "conscience", and the partial narrator of the story. Christian Rub as Mister Geppetto, a kind and elderly woodcarver, who creates Pinocchio, and wishes for him to become a real boy. Figaro the cat and Cleo the goldfish are Geppetto's pets. Figaro is a spoiled cat who is prone to jealousy. Cleo is a flirty little goldfish with a habit of being Figaro's counselor. Walter Catlett as "Honest" John Worthington Foulfellow, a sly anthropomorphic red fox who tricks Pinocchio twice in the film. "Giddy" Gideon the Cat, Honest John's mute, crafty, and anthropomorphic feline sidekick. He was originally intended to be voiced by Mel Blanc of Looney Tunes fame (in his second work for Disney until his final work in Who Framed Roger Rabbit), but the filmmakers removed his dialogue from the script in favor of a mute performance just like Dopey in Snow White and the Seven Dwarfs), the circus elephant title character Dumbo, and Tootles in Peter Pan However, Gideon's hiccups were provided by Blanc. 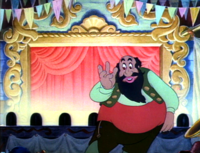 Charles Judels as Stromboli, a large, sinister, bearded Italian puppet-maker, who forces Pinocchio to perform onstage in order to make money. He speaks with an Italian accent, and curses in Italian when he gets angry, though he is identified as a gypsy. He is the only character of the film to be part of the official Disney Villains line-up. Judels also voiced the devious and sadistic Coachman, owner and operator of Pleasure Island, who enjoys turning unruly boys into donkeys. Evelyn Venable as The Blue Fairy, who brings Pinocchio to life, and turns him into a real boy at the end of the film. Frankie Darro as Lampwick, a naughty boy that Pinocchio befriends on his way to Pleasure Island. He is turned into a donkey on Pleasure Island. Stuart Buchanan as the Carnival Barker, the announcer heard on Pleasure Island. In September 1937, during the production of Snow White and the Seven Dwarfs, animator Norman Ferguson brought a translated version of Carlo Collodi's 1883 Italian children's novel, The Adventures of Pinocchio to the attention of Walt Disney. After reading the book "Walt was busting his guts with enthusiasm" as Ferguson later recalled. Pinocchio was intended to be the studio's third film, after Bambi. However, due to difficulties with Bambi (adapting the story and animating the animals realistically), it was put on hold and Pinocchio was moved ahead in production. Unlike Snow White, which was a short story that the writers could expand and experiment with, Pinocchio was based on a novel with a very fixed story. Therefore, the story went through drastic changes before reaching its final incarnation. In the original novel, Pinocchio is a cold, rude, ungrateful, inhuman creature that often repels sympathy and only learns his lessons by means of brutal torture. The writers decided to modernize the character and depict him similar to Edgar Bergen's dummy Charlie McCarthy, but equally as rambunctious as the puppet in the book. The story was still being developed in the early stages of animation. Early scenes animated by Ollie Johnston and Frank Thomas show that Pinocchio's design was exactly like that of a real wooden puppet with a long pointed nose, a peaked cap and bare wooden hands. Early scenes animated by Frank Thomas and Ollie Johnston show that Pinocchio's design was exactly like that of a real wooden puppet with a long pointed nose, a peaked cap and bare wooden hands. Walt Disney, however, was not impressed with the work that was being done on the film. He felt that no one could really sympathize with such a character and called for an immediate halt in production. Fred Moore redesigned the character slightly to make him more appealing but the design still retained a wooden feel. Young and upcoming animator Milt Kahl felt that Thomas, Johnston and Moore were "rather obsessed with the idea of this boy being a wooden puppet" and felt that they should "forget that he was a puppet and get a cute little boy; you can always draw the wooden joints and make him a wooden puppet afterwards". Hamilton Luske suggested to Kahl that he should demonstrate his beliefs by animating a test sequence. Kahl showed Disney a test scene in which Pinocchio is underwater looking for his father. From this scene Kahl reenvisioned the character by making him look more like a real boy, with a child's Tyrolean hat and standard cartoon character four-fingered (or three and a thumb) hands with Mickey Mouse-type gloves on them. The only parts of Pinocchio that still looked more or less like a puppet were his arms, legs and his little button wooden nose. Disney embraced Kahl's scene and immediately urged the writers to evolve Pinocchio into a more innocent, naïve, somewhat coy personality that reflected Kahl's design. However, Disney discovered that the new Pinocchio was too helpless and was far too often led astray by deceiving characters. Therefore, in the summer of 1938 Disney and his story team established the character of the cricket. Originally the cricket was only a minor character that Pinocchio killed by squashing him with a mallet and that later returned as a ghost. 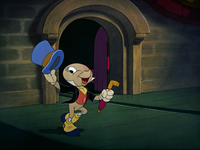 Disney dubbed the cricket Jiminy, and made him into a character that would try to guide Pinocchio into the right decisions. Once the character was expanded, he was depicted as a realistic cricket with toothed legs and waving antennae, but Disney wanted something more likable. Ward Kimball had spent several months animating a "Soup Eating Sequence" in Snow White, which was cut from the film due to pacing reasons. Kimball was about to quit until Disney rewarded him for his work by promoting him to the supervising animator of Jiminy Cricket. Kimball conjured up the design for Jiminy Cricket, whom he described as a little man with an egg head and no ears. "The only thing that makes him a cricket is because we call him one," Kimball later joked. Dickie Jones (right) voices Pinocchio in the film. Due to the huge success of Snow White, Walt Disney wanted more famous voices for Pinocchio, which marked the first time an animated film had used celebrities as voice actors. He cast popular singer Cliff Edwards, also known as "Ukelele Ike", as Jiminy Cricket. Disney rejected the idea of having an adult play Pinocchio and insisted that the character be voiced by a real child. He cast 12-year-old child actor Dickie Jones, who had previously been in Frank Capra's Mr. Smith Goes to Washington. He also cast Frankie Darro as Lampwick, Walter Catlett as Foulfellow the Fox, Evelyn Venable as the Blue Fairy, Charles Judels as both the villainous Stromboli and the Coachman, and Christian Rub as Geppetto, whose design was even a caricature of Rub. Another voice actor recruited was Mel Blanc, best remembered for voicing many of the characters in Warner Bros. cartoon shorts. Blanc was hired to perform the voice of Gideon the Cat. However, it was eventually decided that Gideon would be mute, so all of Blanc's recorded dialogue was subsequently deleted except for a solitary hiccup, which was heard three times in the finished film. Animation began in September 1938. During the production of the film, the character model department was headed by Joe Grant, whose department was responsible for the building of three-dimensional clay models of the characters in the film, known as maquettes. These models were then given to the staff to observe how a character should be drawn from any given angle desired by the artists. The model makers also built working models of Geppetto's cuckoo clocks, as well as Stromboli's gypsy wagon and the Coachman's carriage. However, owing to the difficulty animating a realistic moving vehicle, the artists filmed the carriage maquettes on a miniature set using stop motion animation. Then each frame of the animation was transferred onto animation cels using an early version of a Xerox. The cels were then painted on the back and overlaid on top of background images with the cels of the characters to create the completed shot on the rostrum camera. Like Snow White, live-action footage was shot for Pinocchio with the actors playing the scenes in pantomime, supervised by Hamilton Luske. Rather than tracing, which would result in stiff unnatural movement, the animators used the footage as a guide for animation by studying human movement and then incorporating some poses into the animation (though slightly exaggerated). Pinocchio was a groundbreaking achievement in the area of effects animation. In contrast to the character animators who concentrate on the acting of the characters, effects animators create everything that moves other than the characters. This includes vehicles, machinery and natural effects such as rain, lightning, snow, smoke, shadows and water, as well as the fantasy or science-fiction type effects like Fairy Dust. The influential abstract animator Oskar Fischinger, who mainly worked on Fantasia contributed to the effects animation of the Blue Fairy's wand. Effects animator Sandy Strother kept a diary about his year-long animation of the water effects, which included splashes, ripples, bubbles, waves and the illusion of being underwater. To help give depth to the ocean, the animators put more detail into the waves on the water surface in the foreground, and put in less detail as the surface moved further back. After the animation was traced onto cels, the animators would trace it once more with blue and black pencil leads to give the waves a sculptured look. To save time and money, the splashes were kept impressionistic. These techniques enabled Pinocchio to be one of the first animated films to have highly realistic effects animation. Ollie Johnston remarked "I think that's one of the finest things the studio's ever done, as Frank [Thomas] said, 'The water looks so real a person can drown in it, and they do.'" The songs in Pinocchio were composed by Leigh Harline with lyrics by Ned Washington. Leigh Harline and Paul J. Smith composed the incidental music score. The soundtrack was first released on February 9, 1940. Jiminy Cricket's song, "When You Wish Upon A Star", became a major hit and is still identified with the film, and later as the theme song of The Walt Disney Company itself. The soundtrack won an Academy Award for Best Original Score. M. Keith Booker considers the film to be the most down-to-earth of the Disney animated films despite its theme song and magic, and notes that the film's protagonist has to work to prove his worth, which he remarked seemed "more in line with the ethos of capitalism" than most of the Disney films. Claudia Mitchell and Jacqueline Reid-Walsh believe that the male protagonists of films like Pinocchio and Bambi (1942) were purposefully constructed by Disney to appeal to both boys and girls. Mark I. Pinsky said that it is "a simple morality tale—cautionary and schematic—ideal for moral instruction, save for some of its darker moments", and noted that the film is a favorite of parents of young children. Nicolas Sammond argues that the film is "an apt metaphor for the metaphysics of midcentury American child-rearing" and that the film is "ultimately an assimilationist fable". He considered it to be the central Disney film and the most strongly middle class, intended to relay the message that indulging in "the pleasures of the working class, of vaudeville, or of pool halls and amusement parks, led to a life as a beast of burden". For Sammond, the purpose of Pinocchio is to help convey to children the "middle-class virtues of deferred gratification, self-denial, thrift, and perseverance, naturalized as the experience of the most average American". Pinocchio went into release accompanied by generally positive reviews. Frank S. Nugent of The New York Times gave the film five out of five stars, saying "Pinocchio is here at last, is every bit as fine as we had prayed it would be—if not finer—and that it is as gay and clever and delightful a fantasy as any well-behaved youngster or jaded oldster could hope to see." Time gave the film a positive review, saying "In craftsmanship and delicacy of drawing and coloring, in the articulation of its dozens of characters, in the greater variety and depth of its photographic effects, it tops the high standard Snow White set. The charm, humor and loving care with which it treats its inanimate characters puts it in a class by itself." The film won the Academy Awards for Best Original Song and Best Original Score, the first Disney film to win either. Many film historians consider this to be the film that most closely approaches technical perfection of all the Disney animated features. Film critic Leonard Maltin said, "with Pinocchio, Disney reached not only the height of his powers, but the apex of what many critics consider to be the realm of the animated cartoon." Despite its initial struggles at the box office, a series of reissues in the years after World War II proved more successful, and allowed the film to turn a profit. By 1973, the film had earned $13 million from the initial 1940 release and four reissues; further reissues in subsequent years have brought Pinocchio's lifetime gross to $84.3 million at the U.S. and Canadian box office. In 1994, Pinocchio was added to the United States National Film Registry as being deemed "culturally, historically, or aesthetically significant". Filmmaker Terry Gilliam selected it as one of the ten best animated films of all time in a 2001 article written for The Guardian and in 2005, Time named it one of the 100 best films of the last 80 years, and then in June 2011 named it the best animated movie of "The 25 All-TIME Best Animated Films". In June 2008, the American Film Institute revealed its "Ten top Ten"—the best ten films in ten "classic" American film genres—after polling over 1,500 people from the creative community. Pinocchio was acknowledged as the second best film in the animation genre, after Snow White. It was nominated for the AFI's 100 Years...100 Movies, and received further nominations for their Thrills and Heroes and Villains (Stromboli) lists. The song "When You Wish Upon A Star" ranked number 7 on their 100 Songs list, and the film ranked 38th in the 100 Cheers list. The quote "A lie keeps growing and growing until it's as plain as the nose on your face" was nominated for the Movie Quotes list, and the film received further nomination in the AFI's Greatest Movie Musicals list. In June 29, 2018, Pinocchio was named 13th best Disney animated film by IGN. On Rotten Tomatoes, a website which aggregates film reviews, the film has the website's highest rating of 100%, meaning every single one of the 47 reviews of the film, from contemporaneous reviews to modern re-appraisals, on the site are positive with an average rating of 9.11 out of 10. The general consensus of the film on the site is "Ambitious, adventurous, and sometimes frightening, Pinocchio arguably represents the pinnacle of Disney's collected works - it's beautifully crafted and emotionally resonant.". On Metacritic, Pinocchio has a weighted score of 99 out of 100 based on 17 critics, indicating "universal acclaim"
With the re-release of Snow White and the Seven Dwarfs in 1944 came the tradition of re-releasing Disney films every seven to ten years. Pinocchio was theatrically re-released in 1945, 1954, 1962, 1971, 1978, 1984, and 1992. RKO handled the first two reissues in 1945 and 1954, while Disney itself reissued the film from 1962 on through its Buena Vista Distribution division. The 1992 re-issue was digitally restored by cleaning and removing scratches from the original negatives one frame at a time, eliminating soundtrack distortions, and revitalizing the color. In 1985, it was released on VHS in North America for the first time and on UK VHS in 1988 for the first time. The digital restoration that was done for the 1992 cinema re-issue was released on VHS in 1993, followed by its fourth VHS release and first release on Disney DVD in 1999. The second Disney DVD release and final issue in the VHS format premiered as part of the Walt Disney Gold Classics Collection VHS/DVD line on March 7, 2000. The Gold Classic VHS/DVD release returned to the Disney Vault on January 31, 2002. A special edition VHS and DVD of the film was released in the United Kingdom on March 3, 2003. The fourth DVD release and first Blu-ray Disc release (the second Blu-ray in the Walt Disney Platinum Editions series) was released on March 10, 2009. Like the 2008 Sleeping Beauty Blu-ray release, the Pinocchio Blu-ray package featured a new restoration by Lowry Digital in a two-disc Blu-ray set, with a bonus DVD version of the film also included. This set returned to the Disney Vault on April 30, 2011. A Signature Edition was released on Digital HD on January 10, 2017 and was followed by a Blu-ray/DVD combo pack on January 31, 2017. In 1987, Filmation released a "thinly-veiled" animated sequel to Pinocchio, titled Pinocchio and the Emperor of the Night. Set a year after Pinocchio became a real boy, the movie received mainly negative reviews from critics and was a commercial failure. Disney sued Filmation for copyright infringement, but Filmation won the lawsuit on the grounds that Collodi's work is in the public domain. Many of Pinocchio's characters are costumed characters at Disney parks. Pinocchio's Daring Journey is a popular ride at the original Disneyland, Tokyo Disneyland, and Disneyland Park in Paris. Pinocchio Village Haus is a quick service restaurant at Walt Disney World that serves pizza and macaroni and cheese. There are similar quick-service restaurants at the Disneyland parks in Anaheim and Paris as well, with almost identical names. Disney on Ice starring Pinocchio, toured internationally from 1987 to 1992. A shorter version of the story is also presented in the current Disney on Ice production "One Hundred Years Of Magic". Aside from the Sega Genesis/Mega Drive, Game Boy, and SNES games based on the animated film, Geppetto and Pinocchio also appear as characters in the game Kingdom Hearts. The inside of Monstro is also featured as one of the worlds. Jiminy Cricket appears as well, acting as a recorder, keeping a journal of the game's progress in Kingdom Hearts, Kingdom Hearts: Chain of Memories, and, Kingdom Hearts II. Pinocchio's home world was slated to appear in Kingdom Hearts 358/2 Days, but was omitted due to time restrictions, although talk-sprites of Pinocchio, Geppetto, Honest John and Gideon have been revealed. As compensation, this world appears in Kingdom Hearts 3D: Dream Drop Distance, under the name "Prankster's Paradise", with Dream world versions of Pinocchio, Jiminy Cricket, Geppetto, Cleo, Monstro and the Blue Fairy appearing. In the mid-2000s, DisneyToon Studios began development on a sequel to Pinocchio. Robert Reece co-wrote the film's screenplay, which saw Pinocchio on a "strange journey" for the sake of something dear to him. "It's a story that leads Pinocchio to question why life appears unfair sometimes," said Reece. John Lasseter cancelled Pinocchio II soon after being named Chief Creative Officer of Walt Disney Animation Studios in 2006. In April 2015, Deadline reported that Disney is developing a live action film based on the animated Pinocchio, with Peter Hedges penning the script. In May 2017, Sam Mendes was in talks to direct the movie from a script by Chris Weitz. Six months later, it was announced that Mendes dropped out of the project. In February 2018, it was reported that Paul King was chosen to direct the film with Jack Thorne re-writing the script. In August of that year, Weitz revealed that the script was still in development and that filming is expected to occur in England and Italy, beginning at some point in 2019. In late-November 2018, Tom Hanks entered early talks to play Geppetto. In January 2019, it was announced that King stepped down as the director for the live-action Pinocchio due to family reasons. ^ "Pinocchio: Detail View". American Film Institute. Retrieved April 12, 2014. ^ a b Barrier 1999, pp. 269–73. ^ "Pinocchio". Box Office Mojo. Retrieved June 10, 2009. ^ a b Gabler 2006. ^ William Ruhlmann. "Cliff "Ukelele Ike" Edwards | Biography". AllMusic. Retrieved February 24, 2014. ^ "Almanac: "Pinocchio"". CBS News. February 23, 1940. Retrieved February 24, 2014. ^ Moritz 2004, p. 84. ^ a b "Pinocchio [RCA] - Original Soundtrack | Songs, Reviews, Credits, Awards". AllMusic. Retrieved February 4, 2014. ^ a b c Roberts 2006, p. 134. ^ Booker 2010, p. 11. ^ Mitchell & Reid-Walsh 2008, p. 48. ^ Pinsky 2004, p. 28. ^ Honeyman 2013, p. 29. ^ Booker 2010, pp. 11–12. ^ Nugent, Frank S. (February 8, 1940). "Movie Review - Pinocchio - The Screen in Review; 'Pinocchio,' Walt Disney's Long-Awaited Successor to 'Snow White,' Has Its Premiere at the Center Theatre-Other New Films". The New York Times. Retrieved February 25, 2014. ^ iPad iPhone Android TIME TV Populist The Page (February 26, 1940). "Cinema: The New Pictures". Time. Retrieved February 25, 2014. ^ a b Thomas 1994, p. 161. ^ Barrier 1999, pp. 318, 602. ^ Barrier 1999, pp. 269–73, 602. ^ "Richard B. Jewell's RKO film grosses, 1929–51: The C. J. Trevlin Ledger: A comment". Historical Journal of Film, Radio and Television, Volume 14, Issue 1, 1994. ^ "Pinocchio - Disney Movies History". Web.archive.org. August 4, 2003. Archived from the original on August 4, 2003. Retrieved February 24, 2014. ^ Maltin, Leonard (1973). "Pinocchio". In Leonard Maltin (Ed. ), The Disney Book, p. 37. New York: Crown Publishers, Inc.
^ Wasko 2001, p. 137. ^ "Movie Box Office Figures". Ldsfilm.com. Retrieved February 4, 2014. ^ "U.S. National Film Registry - Titles". Cs.cmu.edu. Retrieved February 24, 2014. ^ Gilliam, Terry (April 27, 2001). "Terry Gilliam Picks the Ten Best Animated Films of All Time". The Guardian. Retrieved June 15, 2015. ^ Corliss, Richard (June 21, 2011). "Pinocchio | The 25 All-TIME Best Animated Films". Time. Retrieved February 4, 2014. ^ "AFI's 10 Top 10". American Film Institute. June 17, 2008. Retrieved June 18, 2008. ^ "Movies_Ballot_06" (PDF). Retrieved February 4, 2014. ^ "400 Nominees for AFI's 100 Years... 100 Thrills". Listology. Retrieved February 4, 2014. ^ "AFI'S 100 Years...100 Heroes and Villains" (PDF). American Film Institute. June 20, 2007. Retrieved February 4, 2014. ^ "AFI's 100 YEARS...100 SONGS". American Film Institute. June 22, 2004. Retrieved February 4, 2014. ^ "AFI'S 100 Years... 100 Cheers" (PDF). American Film Institute. June 20, 2007. Retrieved February 4, 2014. ^ "AFI'S 100 Years... 100 Movie Quotes" (PDF). American Film Institute. June 20, 2007. Retrieved February 4, 2014. ^ "AFI's 100 YEARS OF MUSICALS". American Film Institute. September 3, 2006. Retrieved February 4, 2014. ^ "The 25 Best Disney Animated Movies". IGN. Retrieved June 29, 2018. ^ a b "Pinocchio (1940)". Rotten Tomatoes. Retrieved April 30, 2017. ^ "Pinocchio (1940) - Release Summary". Box Office Mojo. Retrieved February 14, 2014. ^ Hunter, Stephen (June 25, 1992). "'Pinocchio' returns The restored print looks better than the original". The Baltimore Sun. Retrieved February 4, 2014. ^ "Disney Releases 'Pinocchio' Video". Chicago Tribune. July 12, 1985. Retrieved January 14, 2016. ^ "Pinocchio (Gold Classic Collection) [VHS]: Dickie Jones, Christian Rub, Mel Blanc, Don Brodie, Walter Catlett, Marion Darlington, Frankie Darro, Cliff Edwards, Charles Judels, Patricia Page, Evelyn Venable, Ben Sharpsteen, Bill Roberts, Hamilton Luske, Jack Kinney, Norman Ferguson, T. Hee, Wilfred Jackson, Aurelius Battaglia, Bill Peet: Movies & TV". Amazon.com. Retrieved February 4, 2014. ^ "Pinocchio DVD". Blu-ray.com. October 26, 1999. Retrieved February 4, 2014. ^ "Time Is Running Out ... Four of Disney's Greatest Animated Classics Are Disappearing Into the Vault". TheFreeLibrary.com (Press release). Walt Disney Press Release. PR Newswire. January 23, 2002. ^ "Pinocchio Blu-ray: 70th Anniversary Platinum Edition". Blu-ray.com. Retrieved February 4, 2014. ^ "Pinocchio: 70th Anniversary - Platinum Edition (DVD 1940)". DVD Empire. Retrieved February 4, 2014. ^ "Pinocchio | Disney Movies". Disneydvd.disney.go.com. Archived from the original on March 6, 2012. Retrieved February 4, 2014. ^ JeniLynn Knopp (November 19, 2016). "D23: Pinocchio is joining the Walt Disney Signature Collection on January 10". Insidethemagic.net. Retrieved November 19, 2016. ^ Oh My Disney Contributor (November 19, 2016). "BREAKING: PINOCCHIO TO JOIN THE WALT DISNEY SIGNATURE COLLECTION". Ohmy.disney.com. Retrieved November 19, 2016. ^ a b "Pinocchio's Daring Journey | Rides & Attractions | Disneyland Park | Disneyland Resort". Disneyland.disney.go.com. May 25, 1983. Retrieved February 4, 2014. ^ "Tokyo Disney Resort". Tokyodisneyresort.co.jp. Archived from the original on August 19, 2008. Retrieved February 4, 2014. ^ "Disneyland Paris Rides | Les Voyages de Pinocchio". Parks.disneylandparis.co.uk. Retrieved February 4, 2014. ^ a b "Pinocchio Village Haus | Walt Disney World Resort". Disneyworld.disney.go.com. Retrieved February 4, 2014. ^ a b Blankenship, Bill (December 1, 2013). "Disney on Ice brings back '100 Years of Magic' to Expocentre". CJOnline.com. Retrieved February 4, 2014. ^ "Disney's Pinocchio (Mega Drive): Amazon.co.uk: PC & Video Games". Amazon.co.uk. Retrieved February 4, 2014. ^ a b "Jiminy Cricket - Kingdom Hearts 3D Wiki Guide". IGN. July 31, 2012. Retrieved February 4, 2014. ^ a b "Prankster's Paradise (Riku) - Kingdom Hearts 3D Wiki Guide". IGN. July 31, 2012. Retrieved February 25, 2014. ^ Armstrong, Josh (April 22, 2013). "From Snow Queen to Pinocchio II: Robert Reece's animated adventures in screenwriting". Animated Views. Retrieved April 24, 2013. ^ "DisneyToon Studios to be Restructured and Will Operate as a Separate Unit Within Walt Disney Animation Studios" (Press release). Walt Disney Studios. June 22, 2007. Retrieved February 25, 2014. ^ Fleming Jr., Mike (April 8, 2015). "'Pinocchio'-Inspired Live-Action Pic In The Works At Disney". Deadline. ^ Busch, Anita (May 22, 2017). "Sam Mendes In Early Talks To Direct Disney's Live-Action 'Pinocchio'". Deadline. ^ Galuppo, Mia (November 13, 2017). "Sam Mendes Exits Disney's Live-Action 'Pinocchio'". Hollywood Reporter. ^ Kit, Borys (February 20, 2018). "Disney's Live-Action 'Pinocchio' Enlists 'Paddington' Director". Hollywood Reporter. ^ Medina, Joseph Jammer (August 21, 2018). "Disney's Live-Action Pinocchio Writer Chris Weitz Says They're Still Developing The Script (Exclusive)". LRM Online. Retrieved August 21, 2018. ^ Coggan, Devan (November 29, 2018). "Tom Hanks in early talks to play Geppetto in Disney's live-action Pinocchio". Entertainment Weekly. Retrieved December 1, 2018. ^ "Disney's Live-Action 'Pinocchio' Reportedly Loses 'Paddington' Director". Comicbook. January 13, 2019. Retrieved January 15, 2019. Barrier, Michael (April 8, 1999). Hollywood Cartoons : American Animation in Its Golden Age: American Animation in Its Golden Age. Oxford University Press. ISBN 978-0-19-802079-0. Beck, Jerry (October 1, 2005). The Animated Movie Guide. Chicago Review Press. ISBN 978-1-56976-222-6. Booker, M. Keith (2010). Disney, Pixar, and the Hidden Messages of Children's Films. ABC-CLIO. ISBN 978-0-313-37672-6. Gabler, Neal (2006). Walt Disney: The Triumph of the American Imagination. Vintage Books. ISBN 978-0-679-75747-4. Honeyman, Susan (April 15, 2013). Consuming Agency in Fairy Tales, Childlore, and Folkliterature. Routledge. ISBN 978-1-136-60395-2. Mitchell, Claudia; Reid-Walsh, Jacqueline (2008). Girl Culture: Studying girl culture : a readers' guide. ABC-CLIO. ISBN 978-0-313-33909-7. Moritz, William (2004). Optical Poetry: The Life and Work of Oskar Fischinger. Indiana University Press. ISBN 0-253-34348-8. Pinsky, Mark I. (2004). "4". The Gospel According to Disney: Faith, Trust, and Pixie Dust. Westminster John Knox Press. ISBN 978-0-664-23467-6. Roberts, David (2006). British Hit Singles and Albums. Guinness World Records Limited. ISBN 978-1-904994-10-7. Thomas, Bob (January 1994). Walt Disney: An American Original. San Val, Incorporated. ISBN 978-0-7857-5515-9. Wasko, Janet (June 7, 2013). Understanding Disney: The Manufacture of Fantasy. John Wiley & Sons. ISBN 0-7456-6904-2. Wikimedia Commons has media related to Pinocchio (1940 film).